The closer I got to finishing The Girl Who Circumnavigated Fairyland, the more anxious I got. Not because the plot was building up to a perfect storm of physical peril, a heroine who’s lost everything, and mysteries on the verge of being revealed – though all of that was true – but because I was realizing that the highest rating I could give this book was five cupcakes, and that was not enough. 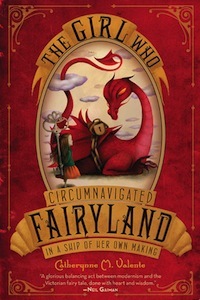 The Girl Who Circumnavigated Fairyland is a stupendous book. It reads like a classic of children’s literature – but not like any particular classic, which is its genius. It’s reminiscent of Oz and Neverland and Wonderland and Narnia, but it’s not aping any of them. It pays tongue-in-cheek tributes to those books while still being wildly inventive, creating its own unique world while still feeling like something that would’ve been handed down lovingly from mother to daughter. September herself is a great character, of course. She’s bold and a bit rude and deeply compassionate and very genre-savvy – although not as genre-savvy as she thinks. She’s also very much a physical hero, wreaking destruction and sustaining somewhat disfiguring injuries along the way, which again, was not something you’d see from Alice Liddell. At one point she rescues Saturday, a Marid (basically a water genie) about her age, by smashing his cage open. He proceeds to be wholeheartedly devoted to her, to the point that when she goes into a dangerous situation, he gives her his token because she’s his knight. I die! Lady knights and the shy boys who love them? So great. And the worldbuilding! So brilliantly done, full of lots of interesting set pieces, all funny or scary or both, while subtly building up the main conflict of the book. I adored A-Through-L, the wyvern who believes his father was a library (and September’s somewhat skeptical but kind response to that). I loved Valente’s take on witches (always dapper) and wishes (they need to be cleaned every so often to keep them at fighting strength) and alchemists (perpetual grad students! knowing a lot of grad students as I do, this one made me smile extra-hard). Again, without mimicking Oz or Narnia or the rest of them, Valente has done what they have been doing for generations, and created a world that children (and 28-year-old bloggers, ahem) will desperately want to run away to, perils be damned. Like I said, my one regret about this book is that I can’t give it more than five cupcakes, with sprinkles and cherries and everything good on top. But five cupcakes it most assuredly gets. Now if you’ll excuse me, I’m off to add everything else Valente has ever written to my To Read list. This entry was posted on Wednesday, March 13th, 2013 at 3:33 pm and is filed under 5 Cupcakes, Portal Fantasy. You can follow any responses to this entry through the RSS 2.0 feed. You can leave a response, or trackback from your own site.